This page covers the author of People of the Book. For other authors named Geraldine Brooks, see the disambiguation page. The Knit Wits Reading Group will meet Wednesday May 21 at 6:30pm at Common Thread to discuss People of the Book, by Geraldine Brooks. For more information or to join the group, contact Leah at lmoore@northshire.com. Tuesday, April 15, 7:30 PM Greenlight Fiction Book Group discusses People of the Book Led by Greenlight general manager Alexis, this book group discusses paperback fiction on the third Tuesday of each month. For April, the group discusses People of the Book, the acclaimed historical novel by Pulitzer Prize winner Geraldine Brooks. Inspired by a true story, this ambitious, electrifying work traces the harrowing journey of the famed Sarajevo Haggadah, a beautifully illuminated Hebrew manuscript created in fifteenth-century Spain. When it falls to Hanna Heath, an Australian rare-book expert, to conserve this priceless work, the series of tiny artifacts she discovers in its ancient binding – an insect wing fragment, wine stains, salt crystals, a white hair – only begin to unlock its deep mysteries, and unexpectedly plunge Hanna into the intrigues of fine art forgers and ultra-nationalist fanatics. Book group picks are always 15% off online or in the store. Geraldine Brooks, the auithor of Caleb's Crossing, the 2013 One Book One San Diego selection, will appear at the USD Warren Auditorium. Mysterious Galaxy will be providing books for sale at this event. If you are unable to attend, but would like a signed copy, please call the San Diego store at 858-268-4747. Geraldine Brooks, the auithor of Caleb's Crossing, the 2013 One Book One San Diego selection, will appear at the Encinitas Library. For more information, please consult the One Book One San Diego website here. Geraldine Brooks Signs Her Book "March"
Geraldine Brooks, winner of the 2006 Pulitzer prize for her book, Caleb's Crossing, will be at St. Mark's High School to sign her new book, March. As the North reels under a series of unexpected defeats during the dark first year of the American Civil War, one man leaves behind his family to aid the Union cause. From Louisa May Alcott’s beloved classic Little Women, Geraldine Brooks has taken the character of the absent father, Mr. March, and tells his story of going off to war and of reopening past relationships in the process. As riveting and elegant as it is meticulously researched, March is an extraordinary novel woven out of the lore of American history. Geraldine Brooks was born and raised in Sydney, Australia. After college, she worked as a reporter for The Sydney Morning Herald and The Wall Street Journal, where she covered crises in the Middle East, Africa, and the Balkans. Her first book, Nine Parts of Desire (1994), was based on her six years living among Muslim women. She also wrote Foreign Correspondence, a memoir of her childhood. She then turned to fiction and won the Pulitzer Prize in 2006 for her second novel, March. Her novels Year of Wonders, Caleb’s Crossing, and People of the Book were bestsellers. She lives with her husband, author Tony Horwitz, in Martha's Vineyard, Massachusetts and Sydney, Australia. 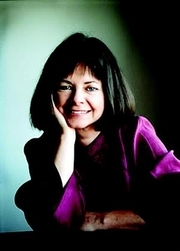 "Geraldine Brooks" is composed of at least 3 distinct authors, divided by their works. You can edit the division. Geraldine Brooks is composed of 2 names. You can examine and separate out names.